Located in the south part of the Cordillera Blanca, its one of the glaciers left in the tropical areas of South America; the glacier is around 8 square kms in size, and around 4km long with a terrestrial snow ending, the glacier is retreating quickly, it has lost 22% of its size and 15.5% on its ice mass in the last 30 years. 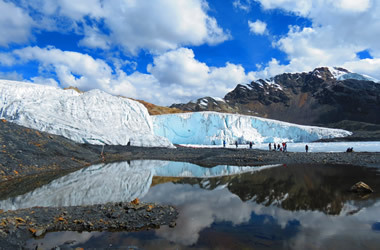 The glacier occupies an Andean peak around 5250masl and so has steep, cliff like edges, with heavily crevassed areas characteristic of a chirque glacier. 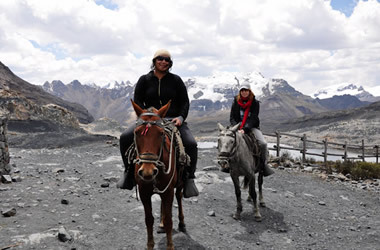 Breakfast in the morning at hotel depart at 8am, driving south side huaraz, at 25km we will visit Recuay province at 3300masl, and continue to Ticampampa 3400masl, Catac 3500masl, continue to Pachacoto from here we will turn east side by unpaved road wonderful landscape of highlands full of straw and cold wind, traditional with sheep herders. After 15km from highway we will stop next to small lake called patococha for birdswatching wild ducks, andean goose caracara birds and others, then the next stop will be at Gasified water stream drinkable gasified water flowing underground, then continue to next stop at enormous flowers of PuyaRaymondi, and changing colour small lake at pumapampa changing color is effect of radiation of the sun and mineral containing rocky inside the water. Continue to petroglyph paints, then after few km aprox 10 we will arrive to Pastoruri parking place, from here to get the Ice Mountain is about 1km, you can make easy hiking or horse back ride to get the snow mountain of Pastoruri, once here you will enjoy walking around and visit the Iced Lake and Ice cave, after few hours of staying in Pastoruri back the same way drive direct to Huaraz arriving around 6pm.